By Chris Williams: Manny Pacquiao turns 33 on Saturday, and that may seem young to some people, it’s not young for a small fighter. They tend to wear down a lot quicker than the bigger guys at the higher weights. If you’ve watched WBO welterweight champion Manny Pacquiao plod his way through his last four fights you may have noticed that his legs are no longer there, and that he can no longer jump around from side to side like he did two years ago. Pacquiao has become a plodder and is so hittable now. The matchmaking obviously that’s being done for Pacquiao has extended his success in a lot of ways. His promoter Bob Arum is known for making sure he puts his fighters in only situations where he’s absolutely certain they’ll win the fight or have a big enough advantage to where they have a very good chance of winning. What we saw in the last fight with 38-year-old Juan Manuel Marquez was a case of Arum having waited three long years after Pacquiao won a controversial split decision against Marquez before finally putting Pacquiao back in with him last month. I’m not sure which fighter took the legs from Pacquiao but I did notice that after the Miguel Cotto fight, Pacquiao could no longer jump around like he used to and looked slower with his hands as well. Could it be that the punishment that he took in that fight caused the deterioration or has Pacquiao started to slow because of the power feeding he’s been doing to stay at welterweight. 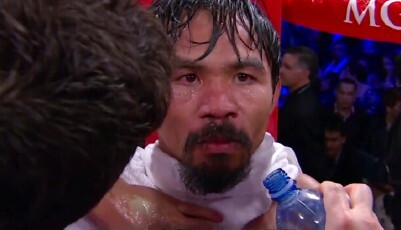 Pacquiao won the fight but the entire world almost to the last person disagrees with the judges and with HBO. Pacquiao isn’t aging as well as Marquez, and I’m not talking about looks. I’m talking about Pacquiao’s legs, hand speed and ability to move around the ring. Pacquiao is more like a fighter in his last 30s than someone only 33. But of course Muhammad Ali started losing his legs early on as well. At around the same age, Ali could move a little still but he was so slow on his feet compared to the Ali in his early 20s. Pacquiao is getting older and Arum may have to start matching him back up with his old Top Rank fighters to keep Pacquiao winning. I Arum makes the mistake of putting Pacquiao in with Floyd Mayweather or a rematch against Marquez, Pacquiao will lose. I think Pacquiao might get one of those gift decisions he’s been getting in his last two fights against Marquez, but all that will do is cause more people to hate him. Sooner or later, top fighters like Pacquiao no longer are given benefit of the doubt if they stop performing at a top level. You may get a two or three gifts, but it can’t go on forever because it’s bad for boxing and it upsets people who come to Las Vegas to gamble. Arum may have to put Pacquiao back on the seniors tour and put him back in with his aging Top Rank stars Joshua Clottey, Miguel Cotto and Antonio Margarito for one more go around. That should wipe out about a year and a half. Arum can then put him in with beatable Top Rank fighters Timothy Bradley and Mike Jones so Pacquiao can stretch his career for a little longer.